More than 50% of adults, and 75% of adults over age 35 have some form of periodontal disease. This disease is sneaky because it usually begins almost imperceptibly with no discomfort. Once it strikes, however, it can be uncomfortable, unattractive, and irreparable. Periodontal disease is commonly called “gum disease” and is a major cause for the loss of teeth in the United States. The disease has several stages and types, but all start as an infection of the gums and gradually move into the bones and ligaments around teeth. If detected early, it can be completely reversed and controlled, but in its later stages it can damage the mouth so severely that teeth fall out or need to be extracted. At Canyon Gate Dental, our goal is to help all of our patients obtain a healthy, beautiful smile that lasts a lifetime. To accomplish this, it is important to us that you know the causes, symptoms, stages, and best ways to treat and prevent this disease. Dental plaque is the primary cause of periodontal disease. Plaque is composed of bits of food, saliva, and the bacteria in your mouth. It is almost invisible until it accumulates, and then it appears a sticky, soft, white substance that collects in the nooks and crannies between and around teeth. Billions of bacteria live inside each speck of plaque. Most have no detrimental effect, but certain bacterial strains within plaque do some very bad things. While certain acid-releasing strains of bacteria within plaque are capable of causing cavities, other strains release toxins that trigger the body’s inflammatory response. These inflammation-inciting bacteria are the reason gum disease happens. Although the inflammatory process is intended to be a protective barrier against infection in our bodies, prolonged inflammation in gum tissues results in tissue damage and causes the gums to separate from the teeth. Removing plaque (i.e. thorough, consistent brushing and flossing)effectively rids the gum tissues of bacterial toxins and halts the body’s inflammatory response, but if left in place, inflammation can spread to, and damage, the underlying bone. Additionally, when plaque is left over time, it becomes a hard substance called tartar or calculus. Tartar can be extremely tenacious and difficult to remove and it further irritates the gums by harboring other, nastier strains of anaerobic bacteria that can thrive below the gums. The earliest stage of periodontal disease is called gingivitis. Gingivitis means inflammation of the gums and is manifested by red, swollen gums that bleed very easily when touched. Plaque and calculus may build up on top of the gums in this stage, but once removed, the gums can return to a healthy status with no lasting damage done. The bone and gum attachment on teeth is unaffected in this early stage. The next stage of the disease is called periodontal disease. As the inflammatory response progresses, the gums begin to separate from the teeth and deep pockets form. 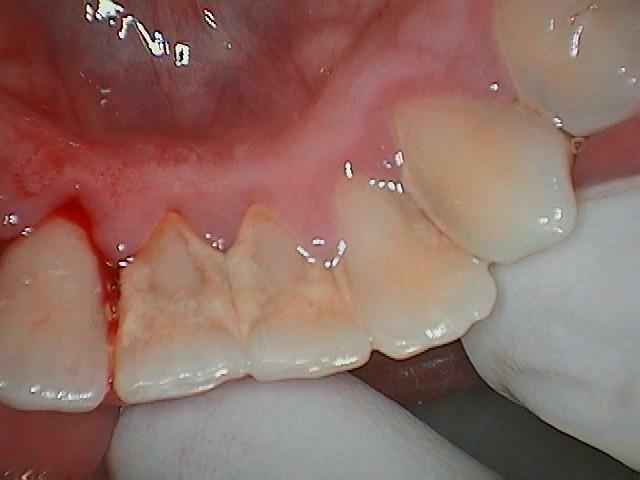 Plaque and calculus move into these pocket areas, and further inflammation results in damaged bone and receding gums. At this stage some lasting, irreparable damage occurs and cleaning more becomes difficult. Periodontal disease is like diabetes—once you have it, you have it for life. Luckily, with good hygiene practices and regular maintenance visits, it can still be well controlled in this stage. If left untreated, periodontal disease progresses to advanced periodontal disease. More plaque and calculus build up in the deep gum pockets, more gum recession occurs, and more bone damage occurs. Very aggressive and virulent strains of bacteria begin to accumulate, which in turn do even more damage. The inflammatory process continues and ultimately the teeth are lost or become so painful that they need to be pulled. If caught early, periodontal disease can be treated by getting a thorough professional cleaning. If the disease has progressed beyond gingivitis, proper treatment usually requires additional procedures, such as scaling and root planning, commonly called a “deep cleaning,” whereby tartar and plaque are removed from the pockets below the gumline. Scaling and root planning may take more than one appointment and periodontal maintenance appointments are recommended every three to four months for individuals who have been diagnosed with the disease. Antibiotics or special antibiotic rinses may also be prescribed to help in advanced cases. Certain dental conditions can also contribute to general or localized periodontal disease. Smoking, chewing tobacco, poor oral hygiene practices, poorly fitting crowns and bridges, misaligned teeth, defective fillings, food traps, teeth grinding, and poor diet can all lead periodontal disease. Replacing or fixing inadequate dental work, ceasing to practice poor habits, and improving dental hygiene are recommended to remedy these situations. By far the best way to deal with periodontal disease is to never get it in the first place. Keeping regular checkup appointments, having good hygiene practices, and eating a healthy diet are the best ways to keep this disease away.